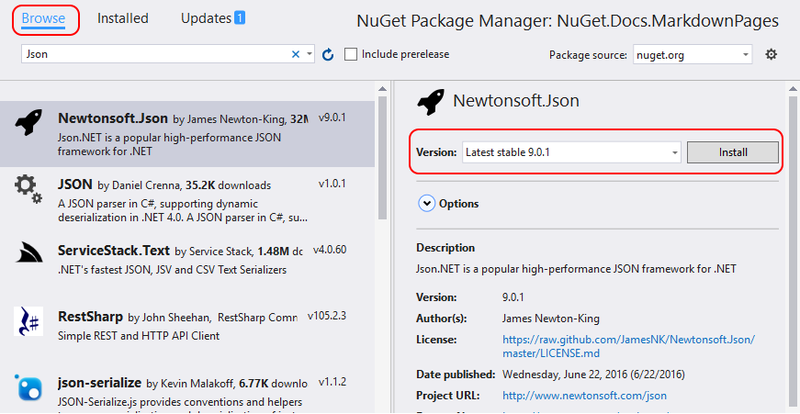 The NuGet Package Manager UI in Visual Studio on Windows allows you to easily install, uninstall, and update NuGet packages in projects and solutions. 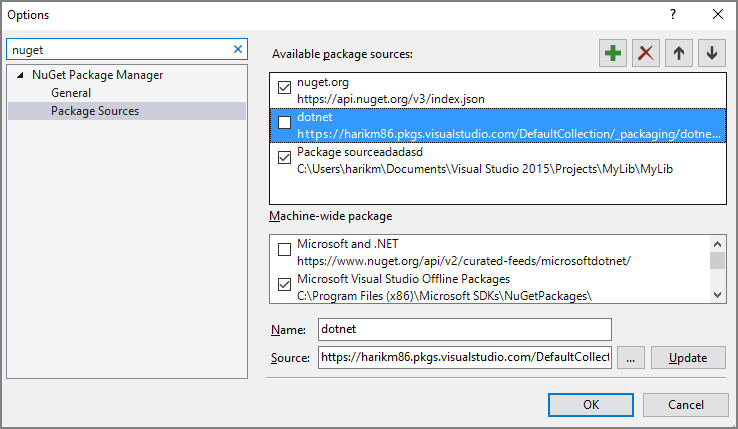 For the experience in Visual Studio for Mac, see Including a NuGet package in your project. The Package Manager UI is not included with Visual Studio Code. Managing packages for the solution (working with multiple projects at the same time). 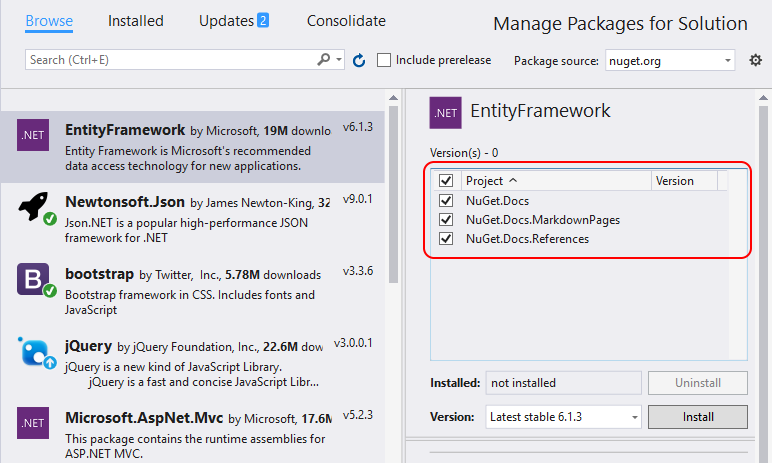 If you're missing the NuGet Package Manager in Visual Studio 2015, check Tools > Extensions and Updates... and search for the NuGet Package Manager extension. 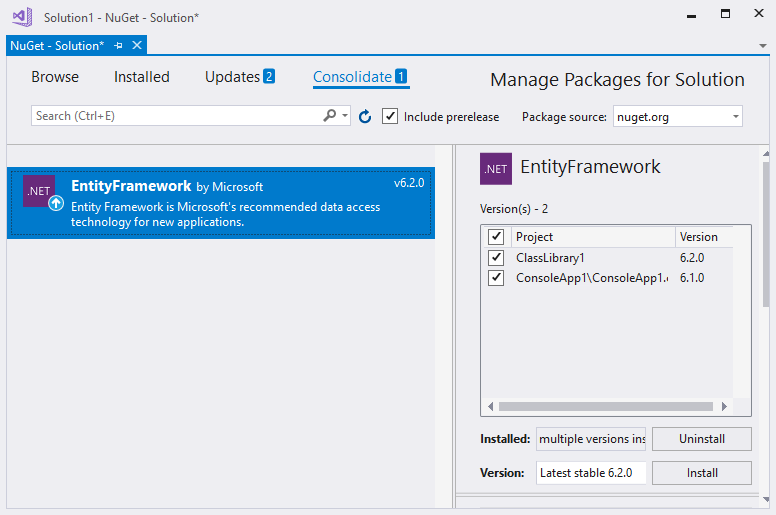 If you're unable to use the extensions installer in Visual Studio, download the extension directly from https://dist.nuget.org/index.html. In Visual Studio 2017, NuGet and the NuGet Package Manager are automatically installed with any .NET-related workloads. 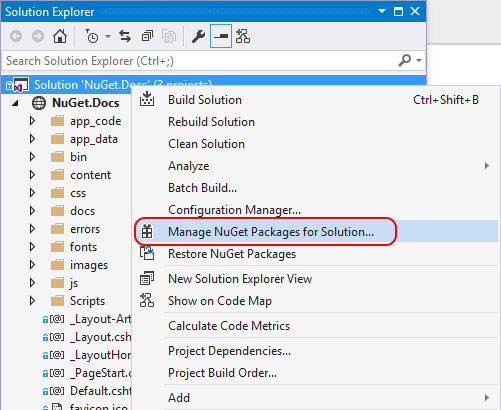 Install it individually by selecting the Individual components > Code tools > NuGet package manager option in the Visual Studio 2017 installer. The Browse tab displays packages by popularity from the currently selected source (see package sources). Search for a specific package using the search box on the upper left. Select a package from the list to display its information, which also enables the Install button along with a version-selection drop-down. Select the desired version from the drop-down and select Install. 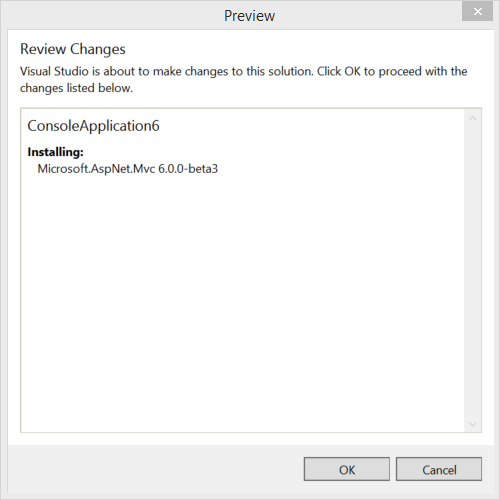 Visual Studio installs the package and its dependencies into the project. You may be asked to accept license terms. When installation is complete, the added packages appear on the Installed tab. Packages are also listed in the References node of Solution Explorer, indicating that you can refer to them in the project with using statements. To include prerelease versions in the search, and to make prerelease versions available in the version drop-down, select the Include prerelease option. Select the package to uninstall (using search to filter the list if necessary) and select Uninstall. Note that the Include prerelease and Package source controls have no effect when uninstalling packages. 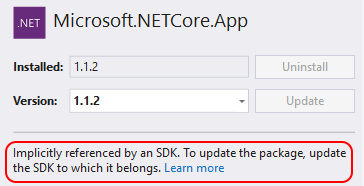 Select the Updates tab to see packages that have available updates from the selected package sources. Select Include prerelease to include prerelease packages in the update list. Select the package to update, select the desired version from the drop-down on the right, and select Update. To update multiple packages to their newest versions, select them in the list and select the Update button above the list. You can also update an individual package from the Installed tab. In this case, the details for the package include a version selector (subject to the Include prerelease option) and an Update button. Managing packages for a solution is a convenient means to work with multiple projects simultaneously. Select the projects to update in the project list. Select the version to use in all those projects in the Version control, such as EntityFramework 6.2.0. The Package Manager installs the selected package version into all selected projects, after which the package no longer appears on the Consolidate tab. To add a source, select +, edit the name, enter the URL or path in the Source control, and select Update. The source now appears in the selector drop-down. To change a package source, select it, make edits in the Name and Source boxes, and select Update. To disable a package source, clear the box to the left of the name in the list. To remove a package source, select it and then select the X button. Using the up and down arrow buttons does not change the priority order of the package sources. 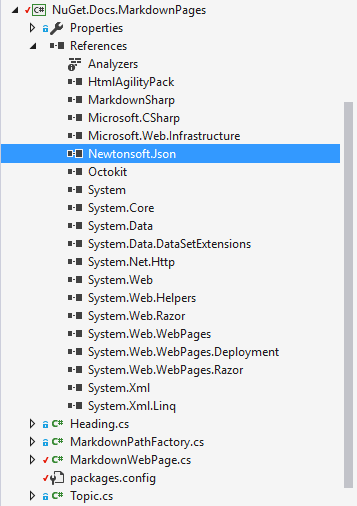 Visual Studio ignores the order of package sources, using the package from whichever source is first to respond to requests. For more information, see Package restore. If a package source reappears after deleting it, it may be listed in a computer-level or user-level NuGet.Config files. 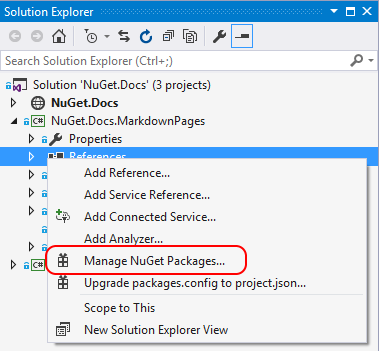 See Configuring NuGet behavior for the location of these files, then remove the source by editing the files manually or using the nuget sources command. When a package is selected, the Package Manager UI displays a small, expandable Options control below the version selector (shown here both collapsed and expanded). Note that for some project types, only the Show preview window option is provided. Ignore dependencies skips installing any dependencies, which typically breaks the package being installed. Lowest [Default] installs the dependency with the minimal version number that meets the requirements of the primary chosen package. Highest installs the highest available version of the package. Prompt instructs NuGet to ask whether to keep or overwrite existing packages. Ignore All instructs NuGet to skip overwriting any existing packages. Overwrite All instructs NuGet to overwrite any existing packages. Remove dependencies: when selected, removes any dependent packages if they're not referenced elsewhere in the project. 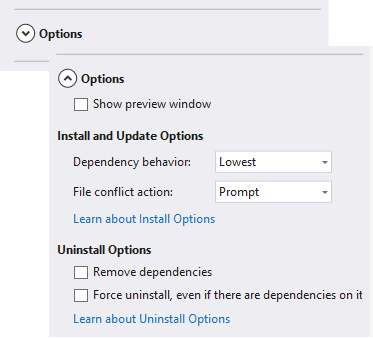 Force uninstall even if there are dependencies on it: when selected, uninstalls a package even if it's still being referenced in the project. This is typically used in combination with Remove dependencies to remove a package and whatever dependencies it installed. Using this option may, however, lead to broken references in the project. In such cases, you may need to reinstall those other packages.